Okieladybug's Scrap N' More: Christmas Ornament...again no ink! So maybe I am getting lazy instead of trying something out of my box...but I didn't ink on this card either! Naw it wasn't laziness. Because I want to tear this one apart too! *okie wonders if she needs to hide all her inks so she won't be tempted*. I think with using the white it gives the card a more elegant look so I am actually okay with it. 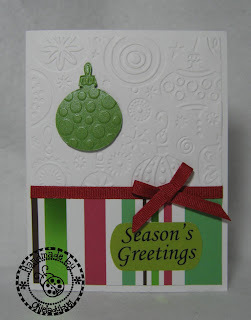 The patterned paper is from the challenge from stamp club. The white paper is Georgia Pacific cardstock. I posted on facebook a few days about that I want to be like that cardstock because I swear it has lost 40lbs! Has anyone else noticed the cardstock being thinner? I know Enfys of Going Buggy said she feels like it is too! 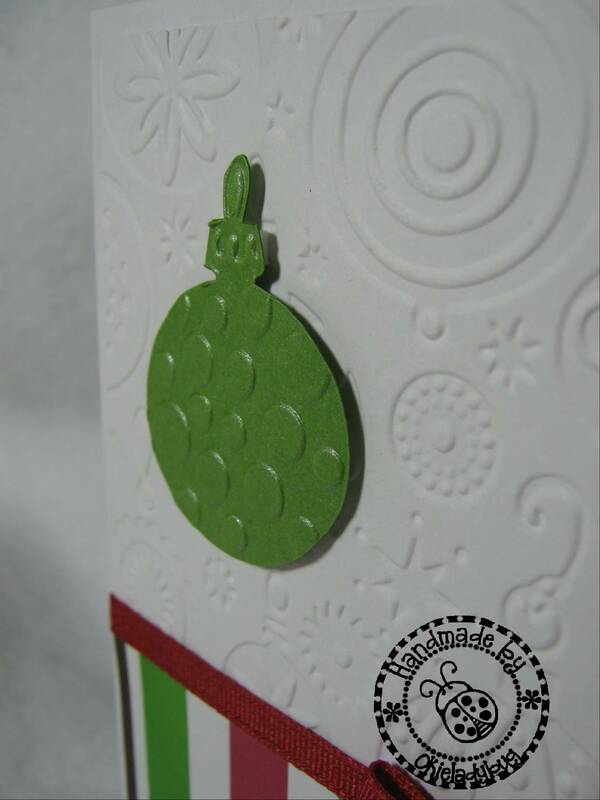 I used a Cuttlebug folder on the top half of a piece of cardstock and then I cut a small scrap of Mica and put it on one of the ornaments on the folder and ran it through the Cuttlebug. Once it was done I just used my Cutterbee Scissors to cut it out and then pop dotted it on top of the white. I think you can see the edge of the white one under the green one. It really wasn't hard to cut out and didn't take too long. The stripe strip is cut at 2 x 4 inches. 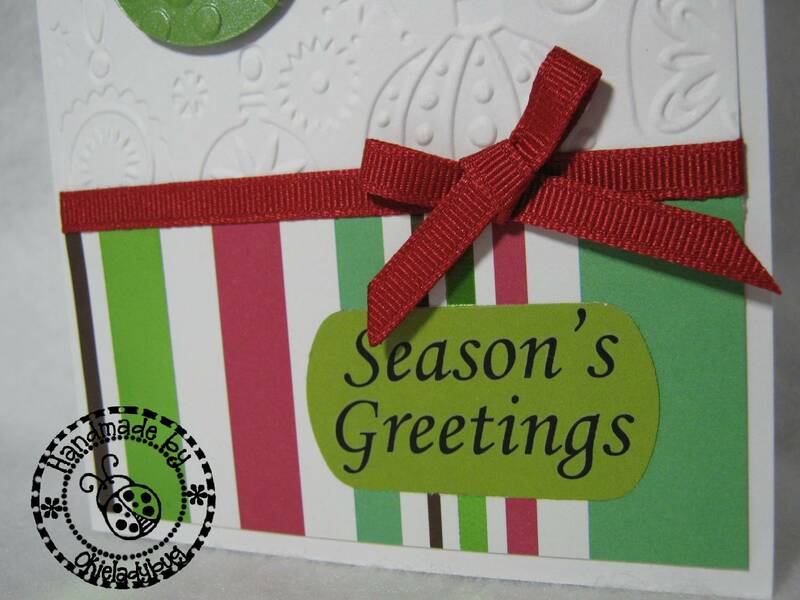 I used a Stampin Up punch to punch out the area for the sentiment. Since the paper was double sided I just flipped the punch out over and then popped it back in the hole. I was going to leave the area white but I liked the color there. The sentiment is a rub-on. 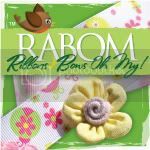 I think I got these rub-ons at Hobby Lobby after Christmas one year for 75% off. If I remember correctly that made them dirt cheap! *okie figures she is dirt cheap, but then wonders if that makes her a dirty girl...wonders if she should call one of her ex-boyfriends and ask if she is a dirty girl...wonders if her readers are reading her mind again and decides to shut off her thoughts*. The rub-on was a straight line but I just cut them apart and stacked to make them fit. Okay I am off to work on my Cricut handbook and overlay storage so ya'll don't be bothering me today! HA HA HA I really am working on that though. I finally found something that will work for me. I will be sure to post it when I am done. Also, don't you guys forget to go enter the giveaway Enfys is doing over at Going Buggy! If you don't know already she is giving away a full set of 148 ProMarkers!! Ah yes.... you've done it again. LOL! Nice card. I love your thoughts!!! Your project are awesome, but for the comedic flavor, I have to admit that you crack me up! 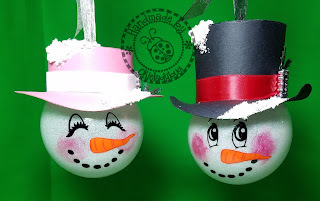 I thought you'd cut the ornament shape out by hand but couldn't remember when I got home and ready to make some of these. 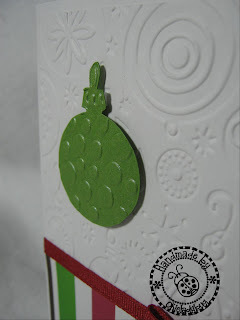 On mine, I cut one ornament out by hand and then realized it was much simpler to just punch it out with a circle punch. I used a metallic pen to outline the wire part on top of the ornament and then stuck on one of the little premade bows I love so much. Mine got posted on my blog today too. Beautiful card! 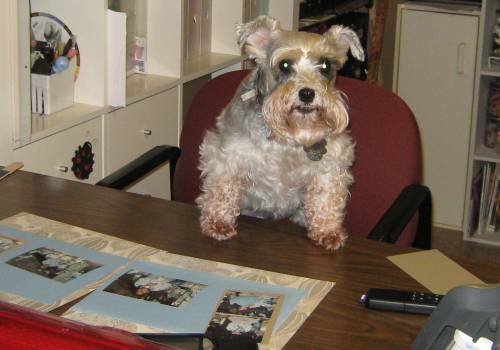 I need to look for that embossing folder! I read about a comparison between Staples cardstock and Wal-Mart's. Sounds like the Staples brand is a little better. I love this card!! I know what you mean about the habit of doing something , mine is flowers. I make them with the experisson and have a hard time not using them on every card. Gads woman! You've done it yet again! Love the card! I love the card. What is Mica? That's one I'm not familiar with! TFS! I like that you punched out double side paper, flipped it over and used it for the words. That saved some paper and the colors have to look good together. Great idea! Love the card. How did you make the white paper? A cuttlebug embossing folder? I have not seen that before! Can you please let me know. Let me know if you can remember. I would love to buy it.